Technology is something that we’re more than happy to keep blabbing on about here at Singletrack Towers. Whether its electronic drivetrains, dropper seatposts, motors that are built for the growing and much discussed e-Bike market, or multi-functional GPS units, there’s a lot to take in and sometimes it’s hard to spot exactly what we should or shouldn’t be buying. 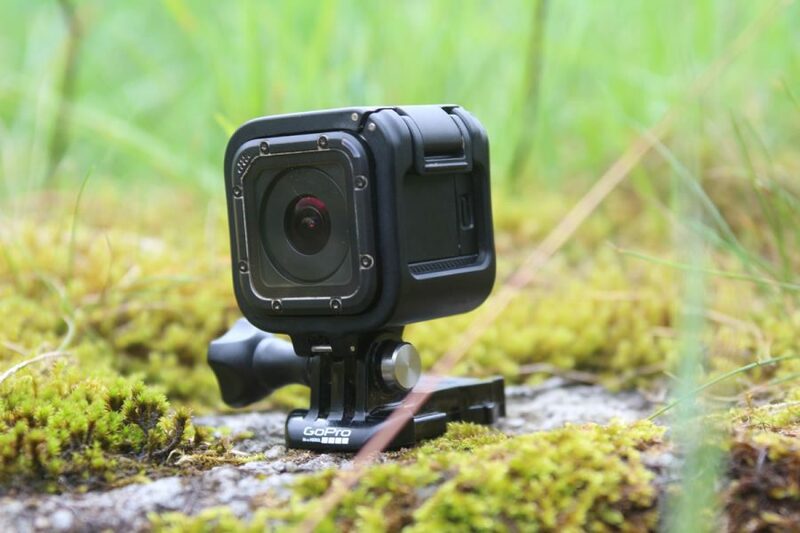 One of the real pioneering companies in the world of tech, especially designed for extreme sports, has to be GoPro. 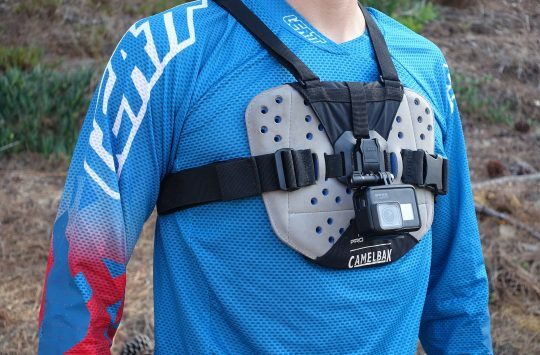 The idea of having a camera small enough to strap to your bike, helmet, or chest, was something we’d never really seen before until its arrival in 2002. 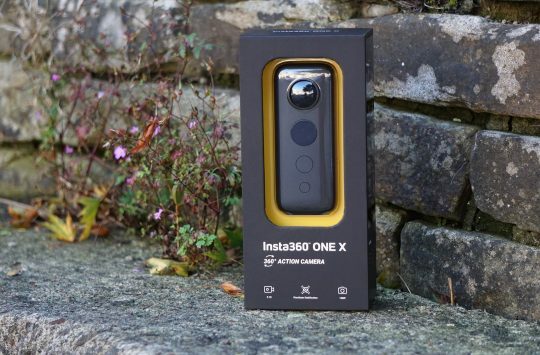 But now you can’t go to a race or event without seeing that little red intermittent flashing light, or hearing the trademark bleep either on the head of a rider, or the end of a specific or homemade GoPole, as someone starts or stops recording. 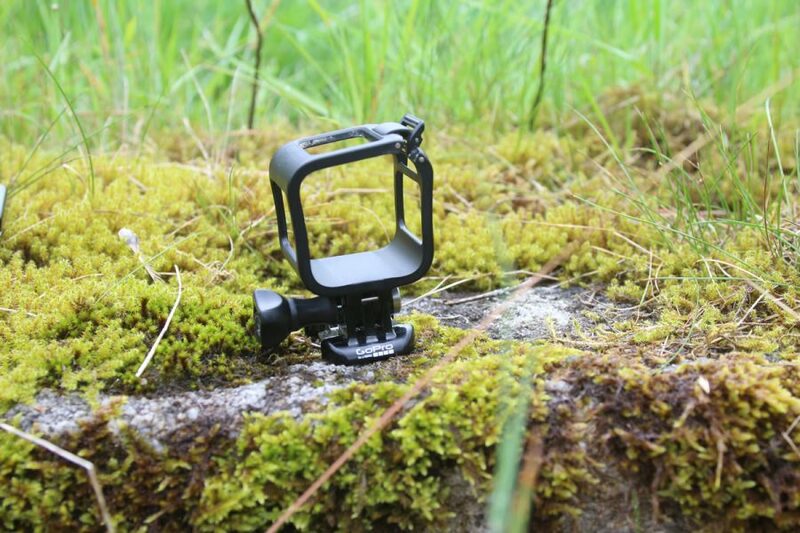 The fancy GoPro Hero 4 Session in it’s nifty little cage. 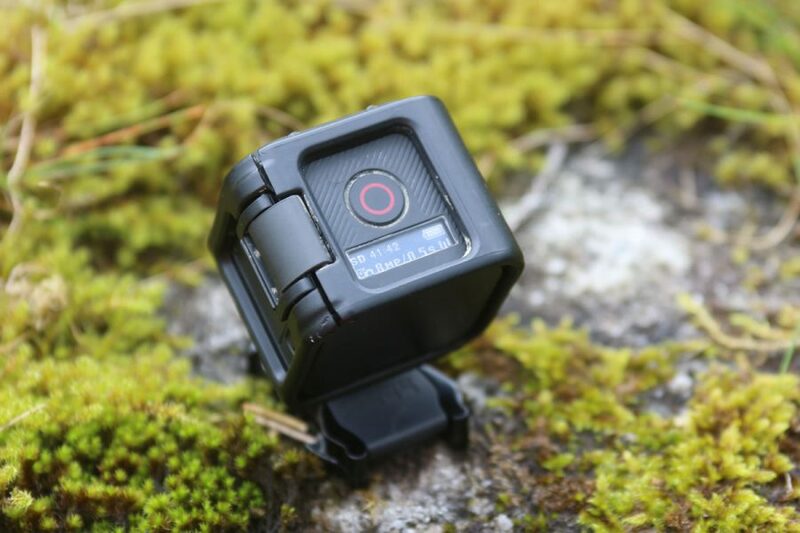 GoPro has adapted to the wants and needs of users over its relatively short time on the market, making models slicker, more rugged and with more options to record video in higher resolutions and differing modes. 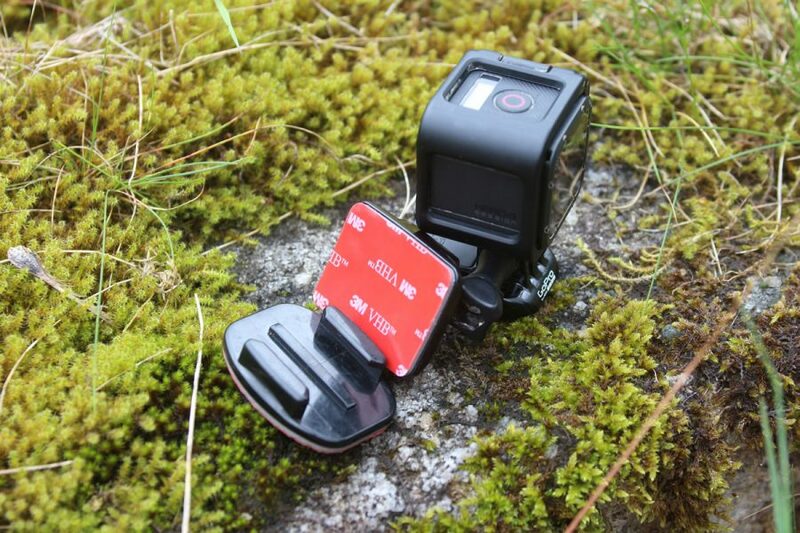 With a trip to the alps on the horizon, I wanted to make sure I had my cameras at the ready and a GoPro was something I didn’t actually have in my personal box of many electrical things. I thought a treat to myself was definitely in order. 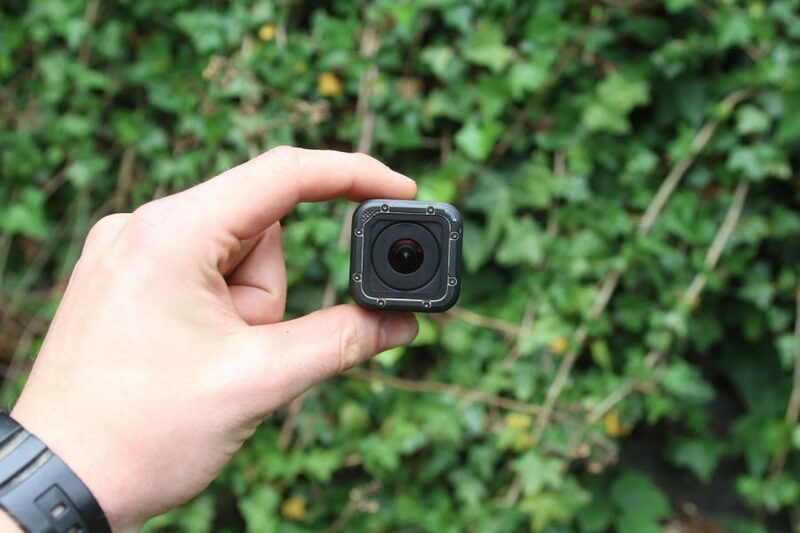 Delivered in a (as you’d expect) very tidy and compact package, the Hero 4 Session landed on my desk a few days later. Unpacking the camera and the first thing that hit me was the size of the bloody thing. 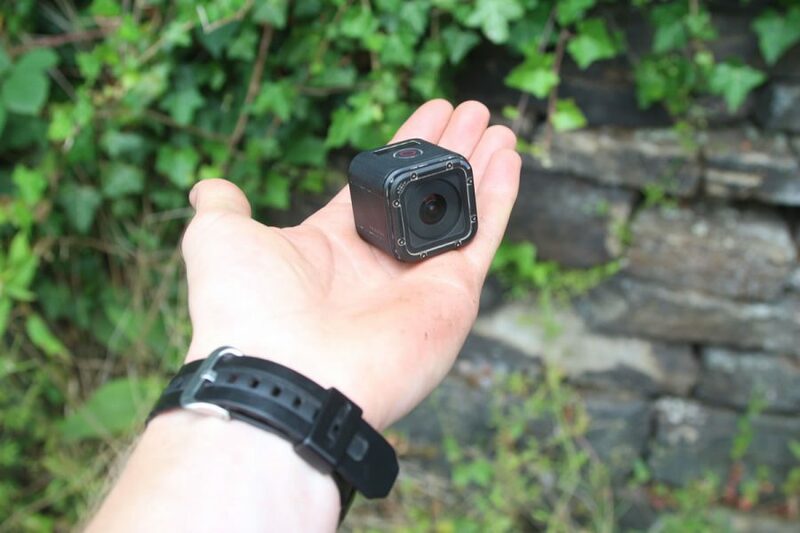 I’d seen the camera in use on YouTube and knew it was pretty small, but when you get it out and have a proper look around it, GoPro have worked some sort of technological magic trickery on this thing. Large sized hands, small sized GoPro. So what have we got here? Straight out of the perspex viewing box, the Hero 4 Session (just Session from here on in) comes as standard, secured in a tidy little cage in which all attachments are then…erm…attached. The camera is pretty much a cube in construction, with a large profile lens on the front. You’ll find the main button on top, which in video mode is responsible for starting and stopping of video recording. In photo mode, this is your shutter button. There’s a smaller mode button on the backside of the unit, so you can change between shooting video and photos. On one side of the camera body there’s a little trap door, which hides the micro SD card slot and charging port. The top also has a small display, showing what mode you’re in, and gives you options to alter shooting modes, or to turn the in built wi-fi on or off. The well recognised bleep, and red lights are still with us on the Session, with lights on the front and back of the camera, so you can be sure when you’re recording. 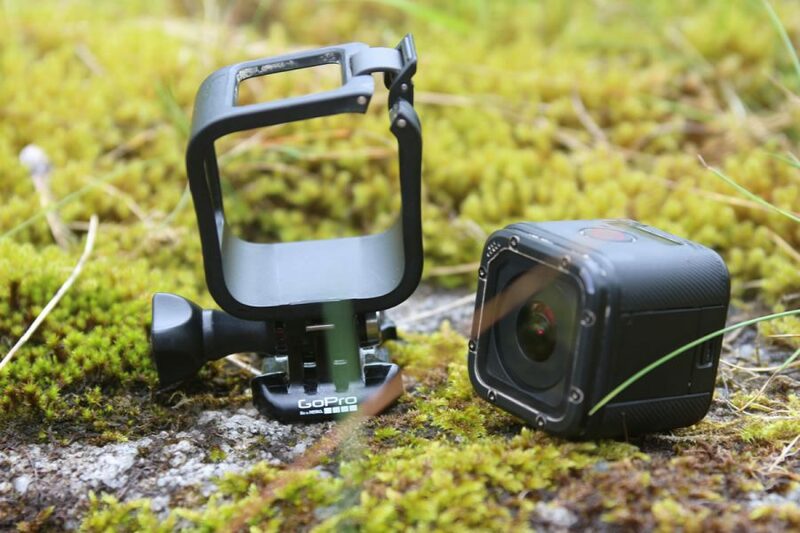 The clip lock system on the cage secures your GoPro Session in place and keeps it there. Along with the camera and it’s handy cage, you also get two different adhesive mounts for use on helmets, car roofs and pretty much anything else you can find that they will stick to. Oh, and the adhesive is very good indeed so don’t be too rash with just firing them on any old surface. Obligatory instruction manuals sit in the base of the box, with the Micro USB charging cable. It’s certainly a tidy package. Supplied with two adhesive mounting pads. One is slightly curved for helmet use. Let’s talk functions and modes then for this little Session. Shooting film in resolutions from WVGA, 720p all the way through to 1440p, this thing has the legs to make our evening and weekend ‘ripping of the trails’ and ‘sick’ edits pretty damn decent, even for the most amateur of film makers. All video modes shoot with an Ultrawide field of view, with 720p and 1080p also offering a medium field option. In photo mode, the Session is capable of shooting in 5 and 8MP, in both standard and burst mode, offering a top end burst setting of 10/1 (10 shots per second). 8MP photo taken with the Session. It was a gloomy/moody day in the Alps. Taking some of the higher end modes from models further up the spec list, the Session can also shoot time-lapse at 7 intervals from 0.5s, all the way through to 60s. All modes and details are shown across the more than readable top screen. 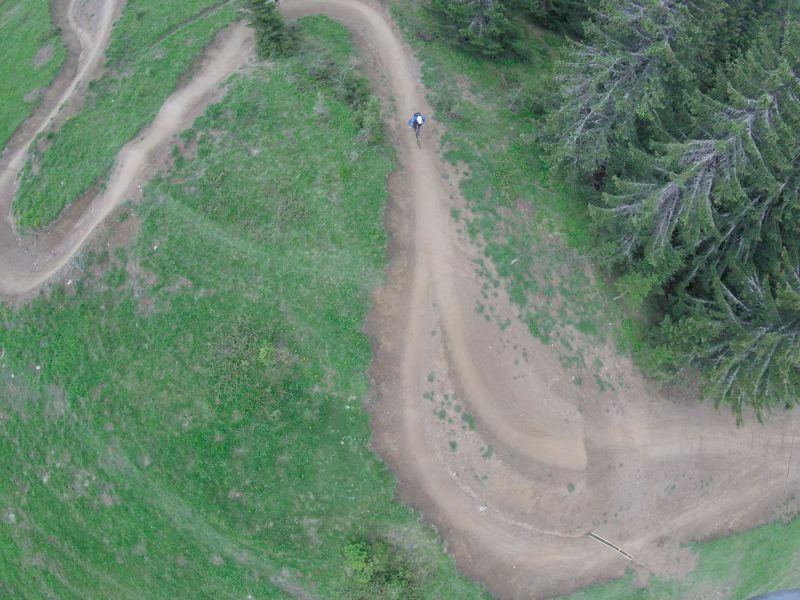 So that’s some of the techy stuff out of the way, but how did the Session fair up out on the trails where it was built for? First comment goes something like this: ‘I’m very, very impressed’. I had used some of the older Hero models in the past and looking at GoPros current model range, and after using this Session for 2 months, I can see no real reason why you would buy the more expensive Hero 4 Silver/Black models, especially if you’re after a camera to take out riding, or to have in the car for any little adventures you might find yourself in. If making professional films is your thing, then the advantage of 4K filming on the larger Hero models may interest you, and that is a more than valid reason for going one step further than the Session. Flick through modes using the small button on the back of the Session. Easy peasy. During the two months of testing, something very odd appeared to be happening with the weather. 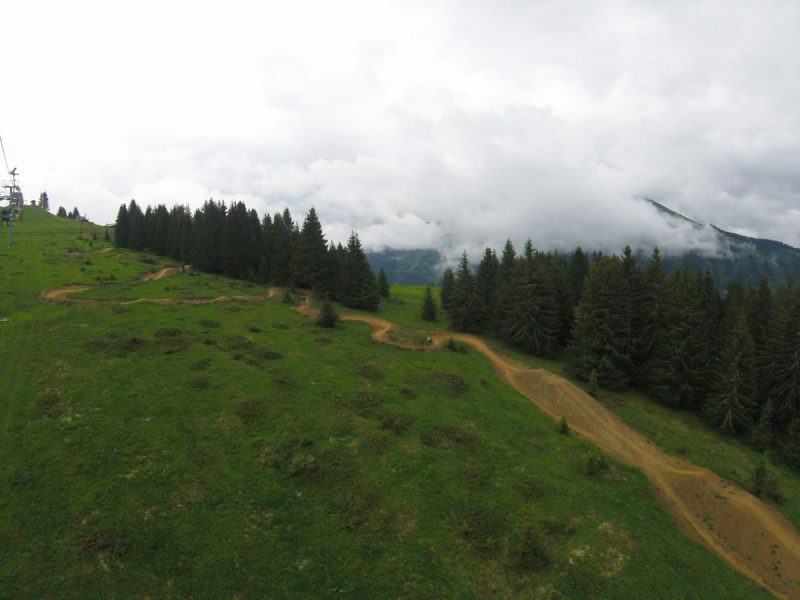 At Fort William, it was 27° heat and blue skies, while in Morzine it was thick mud and heavy rain. Unusual weather patterns aside, the Session got to see all sorts of conditions, and this really put it to the test. 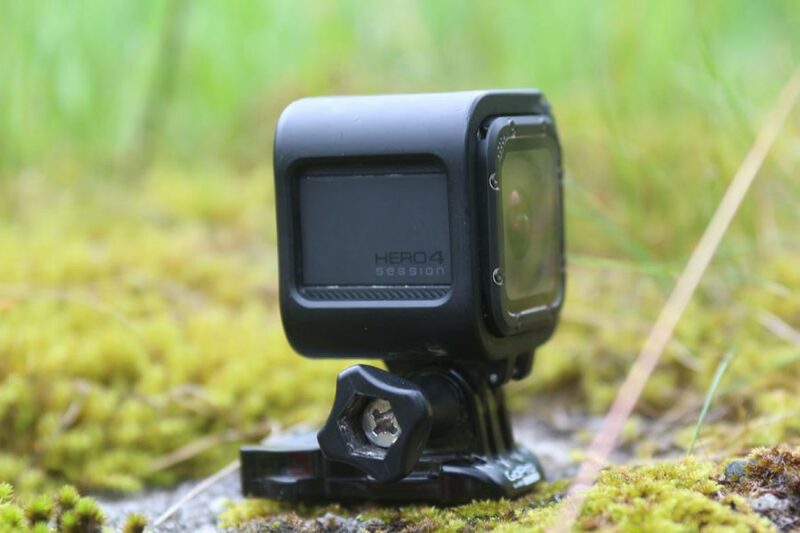 Unlike the larger Hero cameras, the Session is fully waterproof without an additional housing. This was a huge plus for me, not having to worry about the condition of the camera as much while we were glooping around on the Pleney in Morzine. I’d be filming all day long, and would occasionally wipe mud off the lens when I had the chance to let go of the bars for long enough, before cracking on. At the end of the day I’d get home and put the camera straight under the tap to wash all the crap off. The Ultrawide lens captures all the action you may need. Colours come out pretty good too. The side trap door which enables you to get to the memory card and charging port, has a neat seal around the important bits, and has worked like a treat throughout the test period, keeping all moisture out. One of the issues of riding in mud, is dried mud getting into the bolts and small panel gaps between the glass lens and the plastic surrounds. If you get the mud off before it has time to dry, then you’ll have no issues – otherwise you might need to sit down with a safety pin and scrape it all out. I ran the Session on a Chesty (chest mounted attachment) and on a bar mount, each delivering a great range of footage. Changing frame rate can sharpen up and stabilise imagery when the trails get a bit rougher, helping viewers out by minimising sea sickness when it comes to viewing all the footage back. 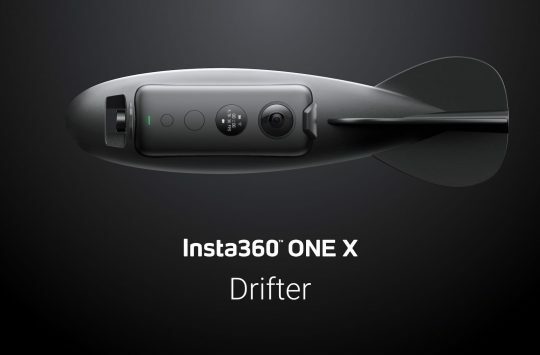 The controls are incredibly intuitive and easy to use, with GoPro making things even easier than before on the Session, allowing the top button to be a one push action, to turn on and also start filming. On GoPros of old, it was a case of turning the camera on, before then pressing another button to begin filming. The Session has improved efficiency in a very simple way and it makes a huge impact when you’re on the trails. If the camera is mounted on helmets, the signature bleep alerts you of the starting and stopping of filming and there is no need to worry about turning the camera off to save battery, as it does that automatically for you – how very thoughtful. 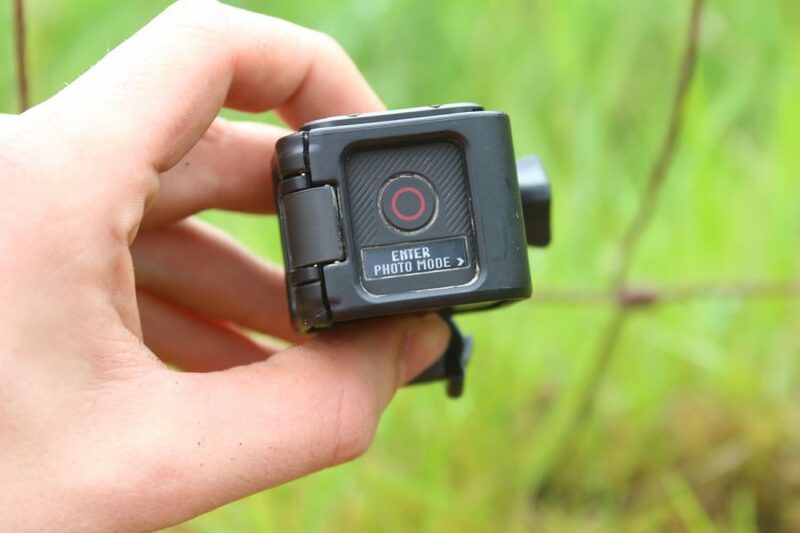 In or out of the cage, the GoPro Session is completely waterproof. The Session is a wicked little camera that I can’t recommend it enough. And that goes for first-time camera users or for those who have owned each edition of the GoPro series. It’s one of those purchases that I definitely justified after it’s first run out. Easy to use, compact and delivers great results. Well done GoPro, well done indeed. Love mine. Was initially concerned about the internal battery as previous Hero’s I’ve owned have quickly required spares for a day (or even just a few hours) out on the bike. Haven’t had a battery issue yet and its been used loads. I love the simplicity of the single button operation and often unclip form the cage to do some handheld filming while moving. How much filming do you get per charge?